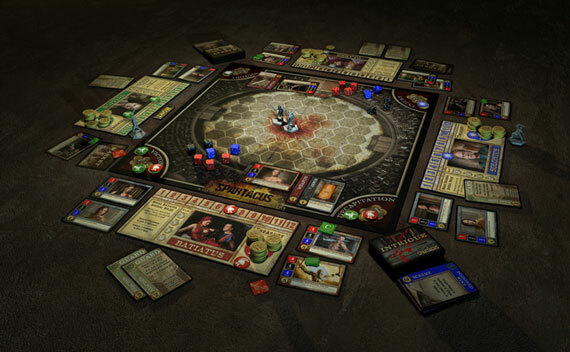 In Spartacus: A Game of Blood & Treachery, an exciting game of twisted schemes and bloody combats inspired by the hit STARZ Original series, each player takes on the role of Dominus, head of a rising house in the ancient Roman city of Capua. Each house is competing for Influence to gain the favor of Rome. Through a combination of political schemes and glorious battles on the arena sands your house will rise in fame and stature. As Dominus, you have a variety of resources at your disposal. Guards protect you from schemes launched by rivals. Slaves run your household and earn gold. Gladiators compete to bring glory to themselves and influence to their Dominus. The goal of the game is to become the most influential house in Capua, securing your family’s power for years to come. During the game, players will bribe, poison, betray, steal, blackmail, and undermine each other. Gold will change hands again and again to buy support, stay someone’s hand or influence their decisions. Will you be the honorable player whose word is their bond or the treacherous schemer whose alliances change with the wind? A look at the components and gameplay. And in Spartacus: A Game of Blood & Treachery you’ll be backstabbing, making promises you never intend to keep, and generally doing your best to keep the other Dominuses (Dominie?) reeling while you advance your influence and win the game. First, I’m going to say this right up front: With the right group of people, this is probably one of the best games I have played in a long, long time. That might be colored by the fact that it’s a game based on a TV series (historically, the kiss of death for board games). Despite this fact, Spartacus is dripping in great gameplay that would make it a fun game even without the program license. So, with that said, here’s a quick rundown. You’re the head (the Dominus) of a Roman household. In the game, there are four households, each with their own strengths that give extra options that add to your strategy. You are to run the house, managing the slaves (which give you money each round) vs your gladiators (who make you pay out money — there’s a lot of upkeep in feeding and watering Gladiators!). At the start of each round you settle with the bank; the more gladiators, the more you have to pay so if you don’t have enough slaves to collect payment with, you might find yourself with a deficit. Following this, you take three intrigue cards and begin negotiations with the other players, playing cards, bribing or coercing the others to help you or to team up against another player. Of course, you can make deals….but you don’t have to keep them. This is ancient Rome. This is every Dominus for him/herself. This is Treachery with a capital T. You can also sell your cards to get more coin. It’s up to you whether you want to sc**w your competition or just add coinage to the bank so you can better prepare for the next phase of the game. The third phase is going to market where you can trade your slaves, gladiators. Cards are laid out, the amount based upon the number of players, where you can bid on more gladiators (possibly Spartacus himself), weapons, armor, more slaves, etc. This is a blind bid with everyone participating. Whoever bids the most coin gets the spoils. But you will want to hold back some of that coin because, at the end of this phase, you bid on hosting the gladiatorial games, which, if you are successful, will give you influence. You then choose the houses that will participate (yours can be one) and the games begin. Players bet on which gladiator/house will win, whether a gladiator will be wounded, or whether a gladiator will be decapitated. The mechanic here is literally Risk, matching die (high to high, etc) to determine who is wounded or who blocks an attack. At the end, the host is able to give thumbs up or down , letting the defeated gladiator live……or die. Of course, bribery to keep that gladiator alive is definitely OK. And expected. • Highly interactive with very little downtime for each player. • Strong thematic gameplay that is totally engrossing. • The gladiatorial battles aspect can slow down the game if you get a participant who prefers running rather than just getting in there and battling it out. • The game board and the Dominus cards warped shortly after opening the box. Spartacus – a game of blood & treachery to give it its full moniker was the first game out the gate from Gale Force 9, they had some considerable success last year with Firefly. And after having savored what they did with that license and much Nom! Nom! later I decided to give this a nibble. The game follows the events of the first series of the popular Starz TV show, based loosely on the true exploits of the slave uprising against their roman oppressors, ooh and Stanley Kubrick made a film of it with Kirk (manly) Douglas and his chin, and some oysters and other subtext. Subtext was something the show didn’t do, it did all full frontaltext It was a gloriously over the top and filthy piece of TV jammed to the hilt with blood, ************ and John Hannah chewing the wobbly scenery and swearing like a sailor. If you’ve not seen it I can heartily recommend giving it a shot, the later season’s failed to capture the fun of the first in my opinion, but that first season was slick with more joy than a freshly oiled gaggle of slave girls. Uh, oh yes sorry got a little distracted. So the game see’s you running a Ludus or Gladiator school (think Harry Potter but with more stabby stuff) and is played over 4 turns, i’ll go into more detail on those in a moment. But to give you the gist you get to do some double dealing and mischief to the other houses, go to market and trade equipment, Gladiators or Slaves and finally the best bit, stage games in the arena and batter the living poop out of the other players premiership Gladiators. And rinse and repeat, that’s it really. The goal of the game is to reach 12 influence, the first player to hit that dizzy height wins the game, and gets to utter assorted roman obscenities at your lowly opponents. You acquire influence along the way by staging the aforementioned games and winning in them or from playing Intrigue cards (more on that in one moment). Turn 1 – Upkeep. – There is a simple economy to the game, each gladiator you own costs you a coin to maintain, that can be offset by keeping slaves i.e. 2 gladiators and 2 slaves evens out with no extra income, grab an extra slave in the market and next round you bag a coin. You start the game with various slaves and gladiators dependent on the house that you have chosen to play with, each coming with different amounts of these things and some special powers. At the start of every round you balance the ledgers dependent on your slave/gladiator ratio. Turn 2 – Intrigue – In this round you are dealt 3 Intrigue cards, these have a variety of powers from dishing out influence to nobbling a rival player’s Gladiators and other nefarious deeds. They all come with a intrigue score that you require to be able to play them, if you don’t have enough fear not as you might be able to cajole another player into helping you reach the target, this can be achieved by either bribes, threats or my favorite lying. You can make as little or as much of this round as you like, initially it can be overlooked only on subsequent plays have there been more and more negotiating and mischief in my group. And another word on those intrigue cards. You can choose to play these cards not only on your opponents but also on yourself, and that’s the rub. I have run into a few games now where a canny opponent has kept a hand of the more powerful Influence cards and then rather suddenly brought proceedings to a sharp halt with a win, leaving the other players struggling to halt the sudden power grab unless they have cards of their own. Turn 3 – Market – This is where you get to buy all the good stuff. Players first get the option to offer up any slaves, gladiators or equipment they have for sale or trade between each other and then the round moves to the auction. Market cards are dealt face down dependent on the number of players and then each is turned over in turn and the players get to make closed fist bids on them. In the event of ties then the tied bidders bid again, slowly rising the price of the cards. This is all great fun, like storage wars with frantic bids getting thrown in to nab that cool gladiator or to stop somebody else from getting it to add to their roster. There is one final round of bidding at the end of this round for who will get to host the forthcoming games, the advantages of this are gaining influence and choosing who gets to fight in the arena. And eventually the host will have the power of life or death over a defeated party in the arena. Turn 4 – The Arena – This is where the fun begins. The host gets to chose who goes in the arena and any player refusing this generous offer loses influence. Once the two victim’s are chosen they pick their Gladiator and any equipment they will be using, then everyone gets to bet on who they think is going to make it out in one piece and whose leaving in a bucket. Gladiators Ready! Using a simple but effective mechanic each Gladiator comes with 3 stats. Attack – The Red Dice. Defense – The Black Dice. Speed – The Blue Dice. Dependent on your chosen Gladiators skills you ****** up the dice for your guy and then the fight is on. The speed dictates how many spaces you can move, after some running about the stabbing begins. Upon attacking the attacker rolls his RED dice the defender the BLACK – these are lined up and compared highest to lowest, with the higher number winning. Any attack dice undefended against are considered a hit. Any wounds sustained from this are taken from your dice pool of your choice weakening your Gladiator. This keeps going until one poor soul runs out of dice, dependent on how many you are whittled down too will dictate whether you live to fight another day or if you lost your head. This is such a simple mechanic but it works so well, especially when you throw in some of the equipment on offer. And once your prize fighter has a few wins under his belt he gains favor making him more valuable in games, and sticking a large target to his head. So much fun, we had people cheering on some of the favorites during some close bouts. Whoever hosted the event has a final say so on whether any injured loser’s live or die with a thumbs up or down. If the Gladiator in question has won a few fights and gained favor his death will cost the host influence, making it a costly move if they are a popular fighter. So this is a great deal of fun. Its a simple game to teach and once a complete turn has been played its easy to get into the swing of things. The components are of a decent enough quality the miniatures for the gladiators are acceptable although most of mine had bent swords and tridents making them look like they where brandishing exotic fruits rather than deadly weapons, but at the games price point its hardly a deal breaker. This does suffer from from the old problem that once you are playing catch up that divide can open pretty quickly, and unless the other players are willing to team up to take down the more wealthy and powerful players you can quickly find yourself being outbid. There is also that intrigue card problem which can just suddenly end a game. But its not all doom and gloom, there is a chunk of fun to had. The arena fights are a hoot and with more plays and a willingness to spot when a player might be moving into that power position should avoid some of those joy kill moments. I wasn’t a big fan of the Spartacus TV show. I have stopped watching it during Season 2, but I loved this hack/slash/muscles/over-the-top-violence idea and I also thought that the Season 1 had a few great moments. However, when this game came out, I read a few reviews and decided to buy it. Now I am glad I did that, because “Spartacus: A Game of Blood & Treachery” is among the best boardgames I have ever played. Each player takes rhe role of Dominus, the owner of gladiator school. The game ends when one Dominus becomes the most influential person in the city – this happens when he collects certain number of influence points. Players collect influenct points by either organizing fights between gladiators, winning those fights, or by undermining their rivals through intrigue and cunning. Intrigue and battle are the core of the game, and they use different mechanics. These mechaics work great – one of the best examples of perfect blending of the “fluff” and rules. Intrigues are resolved by playing various cards, while battle is resolved like a tactical miniature game. Both of these aspects of the game offer a lot of strategic depth. Each Dominus has several abilities that he can use during the Intrigue phase, so each player will have a specific play style. Gladiator battles are great because each combatant has different abilities and can also be equipped with various weapons and armour (expansios also allow you to run 2 on 2, or 3 on 3 battles). During the game, players will also earn money in multiple ways. Then they will be able to use that money to acquire gladiators and equipment, organize gladiator battles, but also bribe other players. And this is one of the best things in “Spartacus” – you can use bribery, but neither you nor the person you are bribing has to respect teir part of the deal. This can lead to very fun situations and makes the game even more interesting (or frustrating, depending on which side you’re on).Generally, all of the mechanics used in this game serve their purpose and none of them seems out of place – the designers really did a great job here. If you play this game with the right group – people who have no problem with intrigue and backstabbing being among the core mechanics – you will have a LOT of fun. However, for some players, this is too much: playing “Spartacus” without treachery and intrigue is possible, but it’s not the way the game should be played (and you will not fully experience everything that the game has to offer). To sum it up: great game design, great mix of theme and rules, lots of player interaction, well-designed mechanics and great replay value. Fun is 100% guaranteed! NOTE: There are two expansions available and they add some really nice options to the game and increase the number of players as well. This game has it all, and the best part is, it is easy to learn and play too. The game has three major sectors, it is a game of marketing, a game of deceit and a game of combat. All three parts are just as fun as the others. You are constantly backstabbing, creating alliances, and building your army of powerful warriors. The combat system is awesome as well. You have three sets of dice, one for combat, one for defense and one for movement and initiative. Each time you are hit, you lose a die of your choice, never being able to go past one until all sets are at one. Once you lose a set to nothing you gladiator has lost. There is gambling involved too, it encompasses all of my favorite gaming features and it keeps it simple, yet is not a basic game. The only flaw I have found is so minor that I didn’t even see it as a flaw, but my brother did, partially because he was playing it, but anyways if you have Theokeles he is usually awesome at a max of 5 combat and 5 defense, but he is slow with only two. He usually wins but because of his speed if you put him against a warrior with 4 speed and a trident which lets you fight at two spaces away it is an automatic win for Theokeles’s opponent(as long as you always win initiative which is not hard to do at 4 dice to 2). Personally it is a nice weakness to be able to beat the ogre simply that usually wins, and it is not that often that this situation comes up, so I liked it, my brother who was all proud of his Theokeles was a little ****** when we figured it out. Other than that though even he loved the game. Undisputedly the Hidden Gem of Gen Con 2012, Spartacus captures the theme and feel of the television show like no other game since FFG’s Battlestar Galactica. In Spartacus, side dealing is not only encouraged, but necessary. Nothing is out of bounds and nothing holds you to your promises but your word. “Sure, I’ll trade you these slaves for your assistance in carrying out my scheme against hated rival…” Only to find out that “hated rival means YOU! But influence and treachery is only half of what makes up this excellent boardgame entry, the other half is Blood Glory on Arena’s storied sands! Each round, one player will host a fighting match in the arena, pitting two players to send their best (or sometimes, worst) combatants onto the sands to fight for their lives and honor, while the powerful houses place their bets on the outcome. This is a fantastic game for anyone looking for a theme heavy game of shifting alliances and shrewd business, made INFINITELY better if you are familiar with the source show. Spartacus is a great rendition of gladiator combat with politics and a market phase prior to the games. It’s got a great way of balancing as you really need to manage your resources. You can buy things and beef up your gladiators, but you’ll rarely host which is the quick way to gain favor to ultimately win. The card mechanics are easy and straight forward. There are effects, reactions, and guards. All of which can bought, sold, traded which is good cause you’ll likely need the resources at some point. It can change quickly too. You could be up by five favor to just lose it the next round due to the schemes/effects. Although the single player with the most favor generally wins, we like to have a primus, or multi team combat and leave the victory to the winning team. What better way to end a gladiator game but a final glorious onslaught in the arena with a two vs two combat. 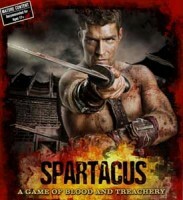 Add a Review for "Spartacus: A Game of Blood & Treachery"